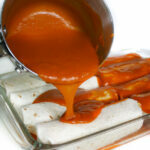 Have you tried making your own enchilada sauce? I love making homemade versions of staple sauces & seasonings. (Such as our favorite Taco Seasoning or Thai Peanut Sauce.) By making your own, you can control the ingredients and leave out any funky additives & preservatives. The sauce is mild as written, so if you prefer spiciness try a little chipotle or cayenne pepper to kick it up. My favorite variation is adding smoked paprika + chipotle powder (usually about 1/4 – 1/2 tsp. in place of the chili powder) which gives it a wonderful, smoky kick. It’s fun to play around with different spices and I’d love to hear your variations if you give it a try! 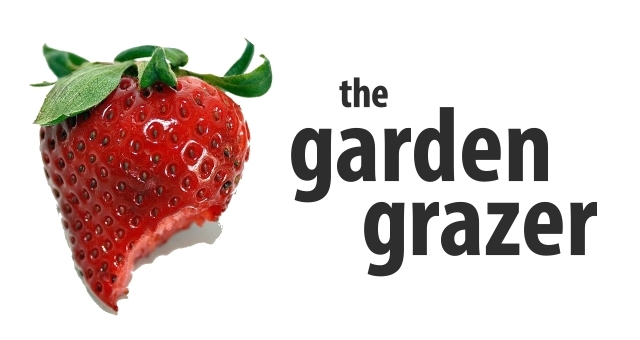 Come join The Garden Grazer on Instagram 🍓 and share a pic if you make/adapt this! I always love seeing your recreations. In a small bowl, combine flour, cumin, garlic powder, onion powder, and chili powder. Reduce to simmer. Cook about 8 minutes or until slightly thickened, whisking occasionally. My favorite variation is adding smoked paprika & chipotle powder (usually about 1/4 - 1/2 tsp. in place of the chili powder) which gives it a wonderful, smoky kick! This is seriously the BEST sauce ever. I had stopped making enchiladas when I ditched processed foods because I could never make it taste the way the canned stuff tastes. This? Tastes even better. I love it!! THANK YOU! Hi Jess!! YAY so glad you like it! Totally agree. I don't think I could live without enchiladas so thank goodness for this 😉 Thanks for the message! oooh this looks so good! i must try it! Omg, this is awesome! I will definitely be trying this one out soon! Enjoy Elana! 🙂 Would love to hear what kind of enchiladas you try it out on! Looks Wonderful and very nice Presentation.. Sauce recipe sounds great…one little recommendation…it looks like you use flour torts in the picture, try using corn tortillas next time. I'm from San Antonio TX, the Tex Mex capitol of the world and my family is from Mexico so that should lend to my street cred on this topic 🙂 Anyway, using corn tortillas is the traditional way to make enchiladas and you will find that the corn tortillas hold up much better than flour. I can only imagine that the flour tortilla get a little mushy or gummy when drenched in sauce and thru the baking process. That won't happen with corn it's a much better texture and tastes AWESOME! Just an idea. Also, if you wrap the corn tortillas in a damp paper towel and nuke em for 2 min. to heat them up, they become very soft and easy to roll without having to lightly fry them before rolling. It reduces the fat and makes the tortillas nice and pliable so they don't break when rolling. Hi Patty! Thanks for the great tips! I LOVE corn tortillas and use them often. They have such amazing flavor, don't they? 🙂 Awesome tip on making them more pliable for rolling. That definitely helps. Thanks for the message! 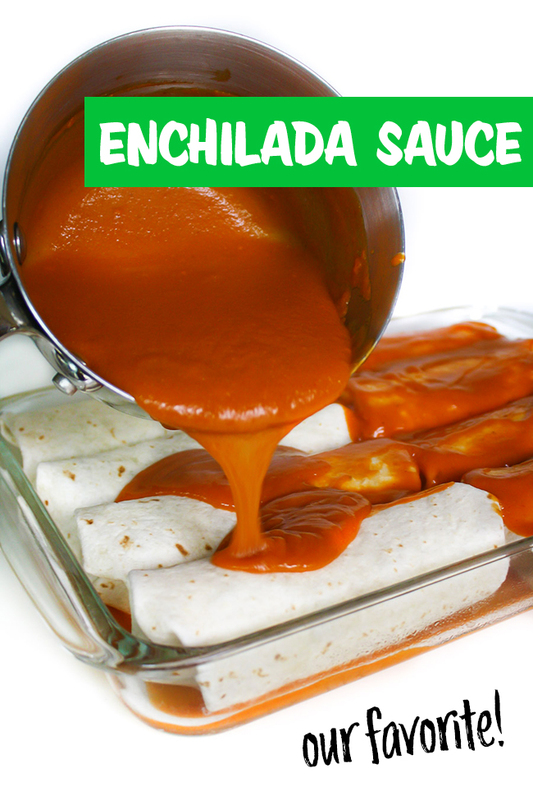 I love enchiladas but I'm more a green enchilada sauce person. Can you tell me how you would change this if I used tomatillos instead? Thanks! My sauce got lumpy with the flour and very thick 🙁 what did I do wrong? AH! Sorry to hear that! That's never happened to me – did you be sure to whisk it well through those initial steps? could you possible substitute the olive oil for veg. oil? OOOOH MY GOODNESS. Just made my first ever homemade enchiladas. Checked out this recipe of yours and, boom baby, this is the business. I never leave comments but I had to thank you for this so simple recipe. I will never order this at a resturant again. Haha, AWESOME!! Congrats on your first homemade enchiladas 😀 Glad they worked out for you!! Whaaaaat?! These are burritos smothered in tomato sauce! If you want a REAL enchilada "sauce", use dried red chile pods. Red chile is much better for you as well. I'm from New Mexico and if we know anything, it's definitely enchiladas. You'll never use a tomato sauce for these again. Sick! Eww! No need to be rude…. No worries. This recipe was easy cause I already had everything. Now I gotta be authentic. Get a clue. There is always someone who does it better. Thanks again for the simplicity. Fantastic recipe! Thank you, Do you think I can make a large batch and freeze it? Have you ever tried that? "I froze the enchiladas and the sauce separately. 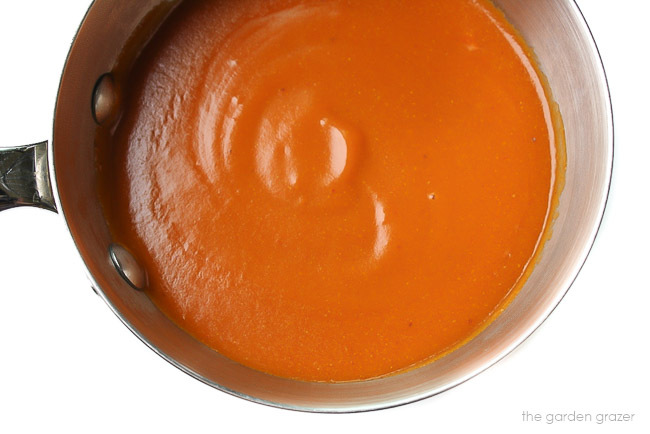 Thawed the sauce in the fridge overnight, then when I was ready to bake, I heated the sauce slowly in a saucepan – whisking helped keep it smooth. Then poured the sauce over the frozen enchiladas, added some cheese, and baked @ 400, covered for 30 minutes and uncovered for 15 minutes." Yum! This sauce is delicious! Much better than the canned stuff. I added a little smoked paprika and cayenne and the family loved it. My little ones who love to "help" me cook even tried licking the pan! Lol thanks for posting. This one is going in my recipe box. Hi Mary! Haha, glad you and your little ones loved it. And hooray for finding "keeper" recipes! I recently started to add smoked paprika too! LOVE that stuff 🙂 Take care! I want to substitute corn starch for the flour (we are wheat free) Do you suppose it would be equal amounts? This is exactly what I need in my life! I've been making smothered burritos a couple times a month since the folks I cook for love them. However, I've been stuck using canned sauce, much to my chagrin. That's all going to change next time I serve up smothered burritos, and I'm really looking forward to it! Thank you! How many ounces does this recipe make? I want to use this recipe for some slow cooked tostadas and the recipe calls for 20 ounces. Thanks! I made this tonight for some roasted vegetable enchiladas. I added a couple of minced chiles, a clove of minced garlic, a pinch of brown sugar, and a small handful of cheddar cheese to thicken it up. It was wonderful! 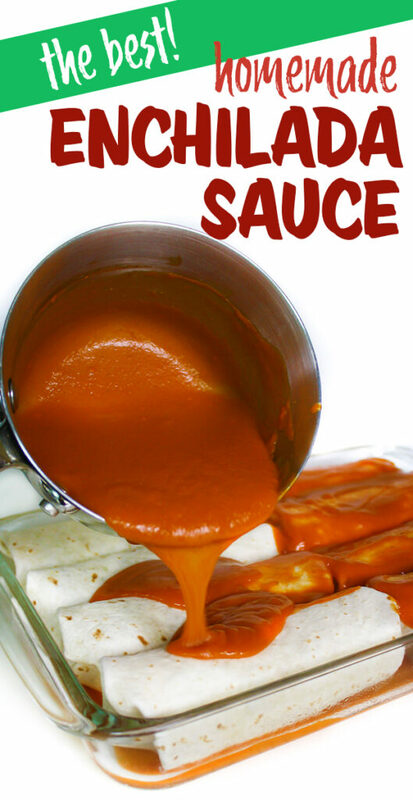 I never knew how easy enchilada sauce was to make! YAY! I love your creativity with adaptions you made!! So glad you enjoyed it. Roasted vegetable enchiladas sound amazing 😀 Thanks for the message! This looks fantastic! Do you think it's possible to freeze some of the sauce for quick dinners? Would my kids be able to eat this? They don't like anything spicy. Hi! Yep, they should be able to – it's a mild sauce and isn't spicy as is. I like to add ground chipotle for a smoky kick if it's just for the adults 🙂 Hope you and the kids enjoy! Hey Carrie!! I've never measured it exactly but you're correct with your estimate! 🙂 Hope you love it! Great recipe! Have you ever tried canning it? 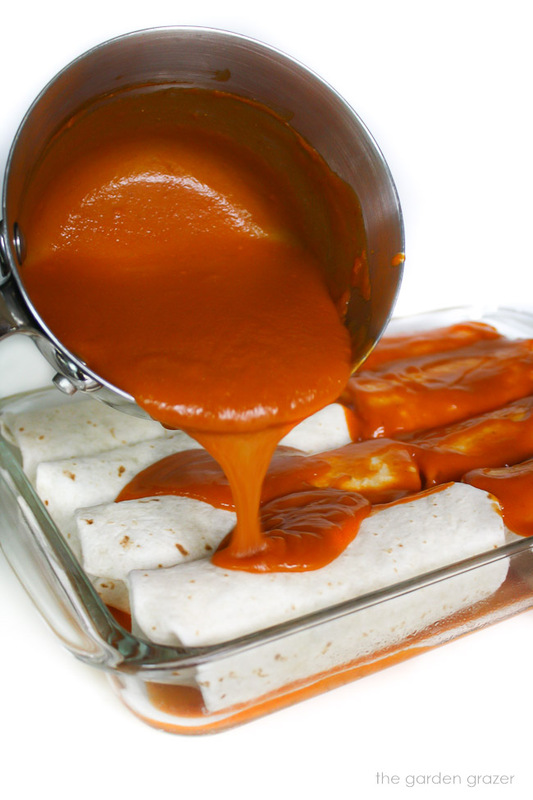 A few summers back I made a different enchilada sauce recipe and it canned well. I assume I could can as I would any other sauce with tomatoes? Absolutely love this sauce. Way better than the canned stuff! Mine too gets a little clumpy when I put flour mixture in, I whisk but it continues to clump. Once I add in the broth and turn up the heat, whisk a little more, it all combines.